Starting in October 2011 hundreds of handmade election-style yard signs will be collected from politically-engaged Chicagoans throughout the city addressing their visions for Chicago. This Mayoral election season is unique in many ways and is a crucial time to highlight visions for the future of the city, which has been so stifled in recent years through voters frustration and helplessness. Each participant will make 3 identical signs. One sign will be placed in the yard of the signmaker, one copy will be placed in the Green Lantern Gallery from 2/4-3/11 and the final will be installed in a public space on the eve (2/21) of election night. A color portrait of each signmaker will be displayed in the gallery from 2/4 until 3/11. The political imagination in Chicago has become stagnant as the result of 22 years of the same mayor and until now, over 50 years since an incumbent has not been running in the election. It was common to encounter a casual “what can you do?” attitude towards corruption and the political status-quo in Chicago. While not everything will change through one election, it is possible that this opening will create the opportunity to articulate some long-term visions for the city of Chicago that come from the grassroots and not from a mayor-dominated top-down political machine. 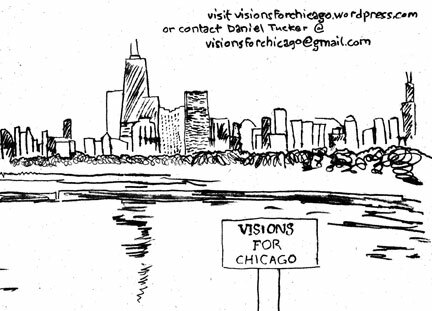 “Visions for Chicago” is a political yardsign project that aims to meet and highlight those people throughout the city with the ambition to create a more livable and vibrant future. Their visions might not fit within the narrow parameters of election issue topics, but through the use of the familiar yard-sign format these creative and critical citizen commentators will express their boldest and possibly wildest visions for the city. It is through invoking the concept of social, political and cultural “vision” for the city that we begin to thaw the ice which has frozen the city into politics-as-usual for so long. It is in the words of these people, where inspiration will come for our own political imaginations which can address what future we might collectively want to share. Yardsigns are the material reminders of election season and have strong associations with election season drama, with frequent newsflashes leading up to elections highlighting candidate interns and associates getting caught ripping the competition’s yardsigns from parks and empty lots (and often replacing them with their own on the eve of election day). Most of the visual landscape in the city is a subsumed to the function of selling people stuff (advertisements on trains, menus, buildings, etc) campaign yard signs are the only publicly displayed evidence that indicates the possibility for political engagement or transformation. While in many other countries the urban environment is littered with political signs and posters, making engagement in political thought and action more undeniable and irresistible. Through the presentation of hand-made yardsigns in peoples yards neighborhoods throughout Chicago will witness the visual and conceptual conflict of generic yardsigns for generic political visions with hand-made visually compelling proposals for bigger, more hopeful, and even utopian scenarios in which the city could embark. By photographing the sign maker and presenting a copy of their sign in the Green Lantern Gallery, the geographically dispersed visions will be collected into one place as the project builds over time (starting before the exhibition opens and continuing through election day). And finally, a third copy of the sign will be collected for public sidewalk installation on election eve night – reflecting that frantic period of activity leading up to what are so-often resource and energy draining elections which distract us from the contemplation and implementation of long-term visions for progressive political and social change and transformation.